Here’s the story: I’ve had a couple of weeks to test out the Loopmasters Ray Keith Drum & Bass Vol.1 Sample Pack and you know what? It’s KILLER! This time around I didn’t just want to add the samples to my existing tunes to check them out, I wanted a new challenge. If I could get a track or two up and running using JUST the samples from the Ray Keith Sample Pack I could work out the depth of the pack and its ability to smash up the DANCE FLOOR! The Evil Plan Is Hatched! The quickest,easiest and nastiest way to check out how phat Loopmasters Ray Keith was, is to use Ableton Live 8. As you may be aware I’ve been using Live 8 more and more and more for this type of thing because its a perfect fit. I fired up Ableton Live, set the BPM to 172 and BOOM away I went. First stop was the BASS. I normally start with drums but I’ve found that if I start with a music element first I don’t get bogged down so much with the technical mumbo jumbo of building beats. Well, how was the Bass then? All 100% quality. There is quite a wide selection of Bass Loops so if you’re after something gritty or smooth or dark or jungle sounding or what ever Ray got you fully covered. There is also a nice selection of Bass one shots for all you peeps out there that want to get down and write your own b-line, in the future I’ll be using one of those sounds but for now I just wanted to get up and running. I quickly selected a bass loop that had a nice steppy riff to it and moved on the beats. I won’t lie to you. The beats in Loopmasters Ray Keith are awesome! Once again you get wide selection of loops to choose from and every one of them has a vibe and sonic flavour. The only downside here was not enough Percussion loops to my liking but hey nothings perfect right? Whilst i had the Bassline rolling I was able to audition a few drum loops. It was a hard choice but I managed to pick a drum loop that had a nice shuffle rhythm to it that worked with the bass line. The single drum shots are all gold. You get solid Kicks, Snares and Hats to play with. Whilst the numbers may be small the quality more then makes up for it. What does this mean for you? Your beats should never sound weak on the dance floor again! Continuing on I moved onto the more musical side of things, like Pads, Atmos, Blips and then FX sounds. Here, the same thing again. A fine selection of loops to choose from in a variety of styles but I really could have done with more FX sounds like swooshes and risers etc I know from experience people on the dance love these sounds. The FX sounds that are there, are 100% Classic Ray Keith sounds so if your after instant Jungle badness (who doesn’t?) you’re sorted. 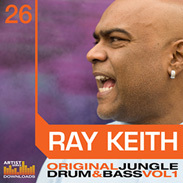 Listen, I think the Loopmasters Ray Keith Original Drum & Bass Vol.1 Sample Pack is a definite must have in your studio. You can use the loops to phatten up your own breaks, bass, fx or whatever or you can use the loops to help kick start your creative juices. Once you got a tune up and running you can pull the loop out and go from there. Click the link below to grab your copy of Loopmasters Ray Keith today.